Description "Anzac Parade 1960s." 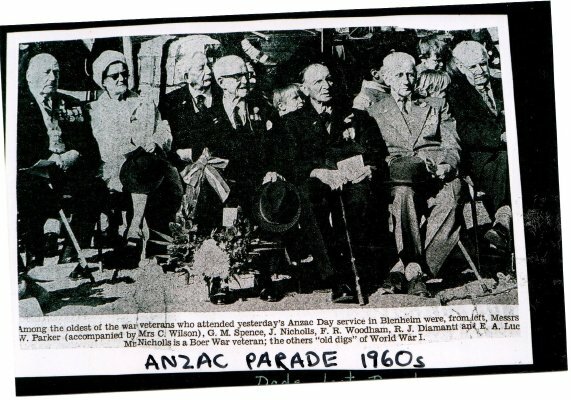 It is a cutout from a newspaper or magazine and says, "Among the oldest of the war veterans who attended yesterday's Anzac Day service in Blenheim were, from left, Messrs W. Parker (accompanied by Mrs. C. Wilson. G.M. Spence, J. Nicholls, F.R. Woodham, R.J. Diamanti and E.A. Luc[as]. Mr. Nicholls is a Boer War veteran; the others "old digs" of World War 1."